This evening’s reading of Grimm’s The Worn-out Dancing Shoes to my granddaughter and her bear inspired me to find my copy of Joseph Jacob’s English Fairy Tales in which can be found the story, Kate Crackernuts. While the motif of the underground dance is similar in both tales―though the gender has been switched from twelve giddy princesses to one unfortunate prince―other events in the two stories are unrelated. Kate Crackernuts begins with a queen and her stepdaughter, Anne, who is far “bonnier” than the queen’s own daughter, Kate. Jealous, the queen visits the henwife for advice. The henwife promises to cure Anne of her good looks, if the girl will come to her while fasting. The first two attempts fail, for Anne, innocently, finds something to eat along the way. On the third attempt the henwife tells the hungry girl to lift the lid of a pot. 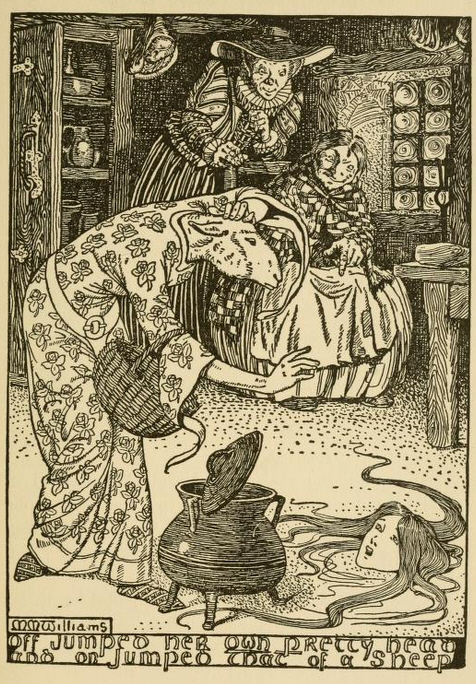 When Anne does, her head falls off into the pot and out jumps a sheep’s head, which attaches itself to her neck. The queen is satisfied. Kate is not happy; she loves her stepsister and now takes over the story. She wraps Anne’s head in linen and they leave the castle to make their way in the world. They end up at another castle, where there are two brothers, one of whom is mysteriously wasting away. Stranger still, those who attend to him at night disappear. The king offers a peck of silver to anyone who will watch over his son after sunset. Kate takes up the challenge. At midnight the prince arises in a trance, and Kate tags along unnoticed though the greenwood. She collects nuts along the way, until they enter a fairy mound. Kate has the wit to hide herself and watch while the fairies dance the prince into exhaustion. At dawn they return and the king enters the bedroom to find Kate sitting up cracking nuts. For a peck of gold she agrees to sit up the next night. 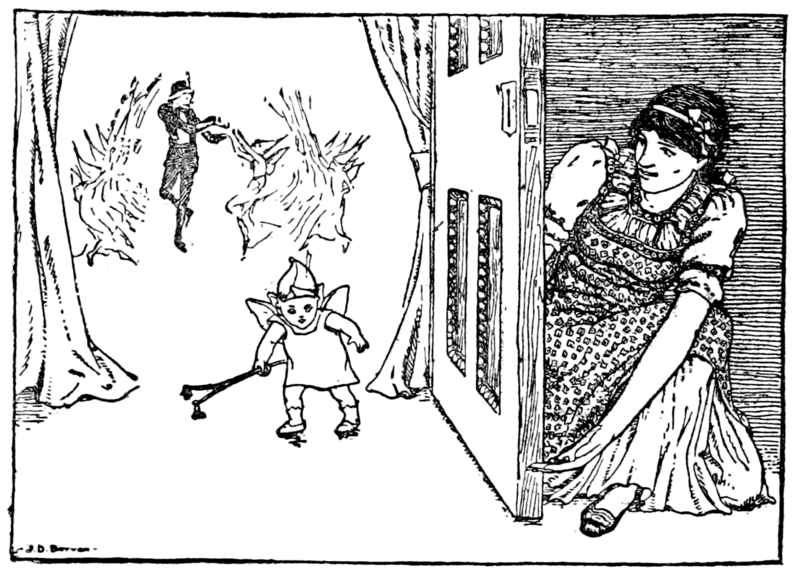 On the second night Kate overhears the fairies say that she could cure her stepsister with the wand that a baby fairy is holding while it toddles about. She rolls nuts to the baby, who has to put down the wand to pick up the nuts. Kate returns with the wand, and cures Anne. Now she demands to marry the prince if she is to stay up another night. On the third trip to the fairy mound she deceives the baby fairy out of a little bird, which she has learned she can feed to the prince to break his spell. On the third morning the king finds Kate and his hale and hardy son cracking nuts. Meantime, the prince’s brother has fallen in love with the restored Anne. The story tells us the well sister marries the sick brother, and the well brother marries the sick sister, and all live happily. Oyez, oyez, oyez. The English Fairy Tales are now closed. Little boys and girls must not read any further. The writing becomes much drier at this point. However, I am excited by his admission that he improved the tale from the garbled version put forward by Andrew Lang, in which both girls are named Kate. My fairy-tale red flag pops up immediately. Is it garbled? I must talk to Mr. Jacobs. I did my research on Joseph Jacobs, determined not to make the same mistake I made with Hans Christian Andersen. I invoked Hans for a visit to Miss Cox’s garden only to find he didn’t speak a word of English. I am safe this time. Joseph Jacobs hailed from Australia, born there in 1854. At eighteen he went to England, taking his degree at St. John’s College, Cambridge. I know Jacobs through four of his books: English Fairy Tales, More English Fairy Tales, Celtic Fairy Tales, and More Celtic Fairy Tales. Primarily though, he was a Jewish scholar. He ended up moving to the United States to become the revising editor of the Jewish Encyclopedia. His interest in folklore constituted something of a hobby during the latter half of his life. Miss Cox’s garden supplies its usual delights. The daffodils are beginning to wane but the tulips show off their vitality. Mr. Jacobs and I arrive at the same time, introducing ourselves at the gate. A pot of tea nestled in a cozy brews on the wrought-iron table in front of a bench, which we visitors find appropriate to our Anglophile nature. After pouring the tea, I drive straight to my point. Joseph looks at me sideways. I put up a hand to stop his objection and push on. Joseph sips his tea and lets me continue (to hang myself?). I note caution in his nod at my statement. I am undeterred. I can see Joseph is thinking about this. Joseph brightens and adds to my argument. I delight in his observation. He goes on. I try not to make the sound of a deflating balloon. Oars dip into the water in a practiced rhythm, the sound of which usually is enough to lull me into contemplation, as Duckworth and I take our jaunt on the river. Today, however, I blather about what is on my mind, and Duckworth is not obliged to take me seriously. I have been plumbing the depths of Kate Crackernuts for him since we shoved off. Duckworth and I approach a part of the river with boulders and a few rapids, and we need watch ourselves before picking up the conversation once more. “Maybe.” I had not thought of it in quite that way. “And what about the sheep’s head?” he continues. I sigh audibly in answer.